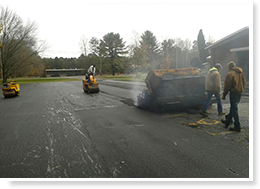 Cornelius Asphalt of Mohawk, NY, has offered affordable asphalt services to residential and commercial customers in the Mohawk Valley and Upstate New York for more than 30 years. We stand behind our experience and expertise, all our work is 100% guaranteed. From farmers in need of multiple private roads on their properties to business owners seeking to provide ADA accessibility, Cornelius’s team can do it all! Cornelius Asphalt is a member of the Mohawk Valley Builders Exchange. We are fully insured, and accredited by the Better Business Bureau with an A rating. For 30 years, Cornelius Asphalt has been a family-owned and operated business based in Mohawk, NY. Now managed by the third generation of our family, we provide professional paving services throughout the Mohawk Valley, and as far away as Albany and Buffalo. Our company’s staff has grown considerably since we first started out, but our core values have remained the same: We provide all of the paving services you need at affordable prices, and our job isn’t finished until we know you’re satisfied.